Nobody should trust Facebook with the private details of their life, but it can be hard to avoid. To quote the late, great Yogi Berra: “Nobody goes there anymore. It’s too crowded.” Facebook has become the commercial equivalent of the never-ending family, school, and former-workplace reunion. It’s where most people we know congregate online. That has remained true even as Facebook has shown through a stream of misleading statements and outright lies that it treats its users like cattle in a digital abattoir. The company makes its money by cutting up our component parts—birthdates, social connections, topical interests, browsing habits—and selling them again and again to other companies. Its security and operational incompetence has also led to massive breaches of our private data, so even if Facebook’s promises were trustworthy, its delivery is unreliable. In 2018 alone, it came out that Facebook had allowed the political-consulting firm Cambridge Analytica to access tens of millions of user profiles and later tried to mitigate the misuse by explaining it wasn’t technically a breach. Facebook accidentally allowed data about billions of its users to be gathered through searches. The company negotiated secret agreements with mobile device makers to share information with them, even if users had blocked third parties from their information. In a leaked internal memo from 2016, a Facebook executive said growth should outweigh all other concerns, even if it enabled terrorists. Facebook published an iOS VPN app, Onavo, designed to intercept users’ private data, violating Apple’s policy on data collection (see “Beware “Protect” In Facebook’s iOS App,” 14 February 2018). After Apple made Facebook take Onavo down, Facebook repackaged the app and slipped it under Apple’s radar (see “Certificate Wars: A Quick Rundown of Apple’s Dustup with Facebook and Google,” 1 February 2019). In the face of all this, Facebook was mostly angry about public perception. And this list of offensive behavior is far from comprehensive! Despite all that, Facebook continues to show revenue growth, user growth, and an increase in routine use of its site. People stick with Facebook because of the network effect—it’s where family and friends are, and it’s a source of “news” (despite the fact that a substantial part of alleged news on the site has no substantive factual basis, especially health news). What if there were another way in which family or close friends could interact in an environment that let them speak freely and share photos and videos without Facebook’s compromises? There is: Slack. 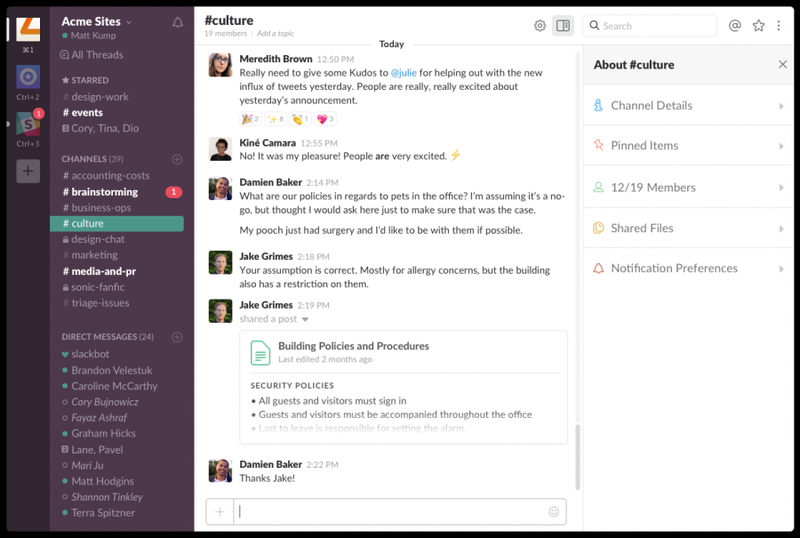 Slack is a group-messaging system aimed at businesses and organizations that combines multi-person conversations, direct messaging, and file sharing. At last report, Slack had eight million daily users, three million of whom are in paid groups. The rest use a robust free tier, which is perfect for families. Members of a Slack “workspace” can upload photos, chat in public channels open to anyone in the group, and use private channels or direct messages for discussions that only the participants know about and can see. My bias is that I just published a new book on how social groups, nonprofits, and businesses can use it, called Take Control of Slack. However, it wasn’t until after the book came out that I had a conversation with TidBITS Publisher Adam Engst about how well Slack could provide safe, controlled online communications for families that are sick of Facebook. It’s also a reasonable solution for friend groups that stay in close contact and want to use a system that is not owned by Facebook (as WhatsApp is) or another privacy-abusing tech giant and that has multi-platform support, unlike Apple’s iMessage. For families, Slack’s combination of free apps, strong privacy, and free service could be what you need to ditch Facebook without losing online connections. Free apps: Because Slack offers apps and browser support across macOS, iOS, Windows, and Android, you aren’t tied to iMessage, WhatsApp, Facebook Messenger, or other systems that require an ecosystem buy-in with a company whose interests don’t align with yours. Free service: The company makes its money—substantial money—on its paid tiers of service, which allows it to operate its free tier as a relatively trivial marketing expense. Slack may be such a good way for families to communicate that it might even bring back online relatives who gave up on other communities. What Can Your Family Do with Slack? Slack is designed around conversations—chat, but structured!—that persist in a long, chronological stream. This kind of informal conversation works well for family groups, where most of what you want to say is inconsequential on a grand scale, and it’s all about being sociable. Each Slack workspace acts like an independent conversational Web site. The person who sets up the workspace invites people, who become members. Only members can view a workspace or post in it. Each workspace is entirely private: without a login, no one else can see anything in it at all. Slack workspaces provide a sense of place: all discussion is organized into a public or private conversation. Public conversations take place in channels, which are like chat rooms open to all members of the Slack group. These channels do best with descriptive names that let people know why they should join. For families, I recommend setting up public channels by branches of an extended family (so your sister can ignore your in-laws’ conversations), parts of the country (so relatives who live elsewhere don’t have to see the local family members’ dinner plans), and events (like Thanksgiving dinner or a reunion). Channels help split up discussions, so people who are interested in only certain topics or a particular branch of the family aren’t overwhelmed by irrelevant chatter. Private conversations can take place in private channels, which are completely hidden from anyone who hasn’t been invited to the channel by the creator, and direct messages (DMs), which work just like group chats or Twitter DMs and are similarly invisible to other Slack workspace members. Members can upload files of any type to any conversation, so Slack is a great way to share photos, movies, Word files, and PDFs. There’s even a way to create a formatted post within Slack that everyone can see and optionally can be allowed to collaborate on. As with any messaging app, notifications are important. Slack has put a lot of effort in there, offering native notifications across every platform it supports, including browser-based notifications in macOS and Windows for its Web apps. Despite its many advantages for family communications, Slack isn’t perfect. Its notifications, for example, are so flexible that it can be confusing to set them up for less-experienced users. More on that shortly. Slack’s limits on free workspaces shouldn’t affect families. Free Slack workspaces can only view and search through the most recent 10,000 messages and use its audio and video calling features for one-on-one—not group—conversations. There is one problem for families that derives from Slack’s privacy rules: it prohibits those under 16 from using its service, likely due to the European Union’s General Data Protection Regulations (GDPR). In the US, children 13 and older may consent to disclose personal information, but the GDPR raised that age to 16. Canada has no legal minimum age. In both the US and EU, a parent can provide consent, but apparently Slack doesn’t want to get into that level of detail. That said, Slack’s enforcement is minimal. It notes, “If you learn that anyone younger than 16 has unlawfully provided us with personal data, please contact us and we will take steps to delete such information.” I wouldn’t advise you to use a service and violate its rules, but it’s also clear this is Slack’s attempt to comply with regulations without the burden of enforcing them. Slack’s main limitation for family use is the lack of any way to group photos and videos. You can upload and view media, but there’s no gallery feature. If that’s important, you can paste in links to galleries stored elsewhere, including shared iCloud albums, or use Flickr. Flickr’s new owners, SmugMug, have robust privacy rules and show ads only on the limited Flickr free tier. Your family could purchase a single Flickr Pro account ($50 a year), and share photos in private albums. If I’ve convinced you to give Slack a try, talk to your family and make sure that everyone is willing to install and use the apps. Like any change, it may require some persuasion, but explaining just how evil Facebook is may help. You may also want to encourage them to read this article. I recommend promising to help those who are less experienced technically get set up. You can also start small: you don’t have to invite everyone at once, and it may be a good idea to begin with your nuclear family or some of the savviest family members and then build from there. Once you have sufficient buy-in, follow these steps. Create a new workspace. Slack offers step-by-step instructions here. It’s important to pick a good name for your team’s Web URL, which is a subdomain of slack.com, because people may need to type it in and it should be recognizable. Try combining some form of your family surnames, as in hartford-gonzales-family.slack.com. Slack will tell you during setup if the name is available. Set up channels. Create a small number of public channels that will help new Slack users find their footing. Slack creates #general and #random by default. I recommend creating a channel for each branch of the family that’s participating, like #hartford-family and #gonzales-family. Also consider geographic channels if multiple family groups live near one another, such as #chicago and #miami. Finally, you might consider creating private channels for nuclear families so they can talk without worrying about others listening in. TidBITS co-founders Adam and Tonya Engst name such channels with the street address of the original family home for their branches, so their private channel with their son Tristan is #50-hickory. Channels can be renamed, so don’t stress if you don’t get it quite right to start. Invite family members. Slack offers the opportunity to invite people to the group during setup, but it’s better to wait until you have everything set up. Make sure you use everyone’s preferred email address because that becomes their Slack login account name. 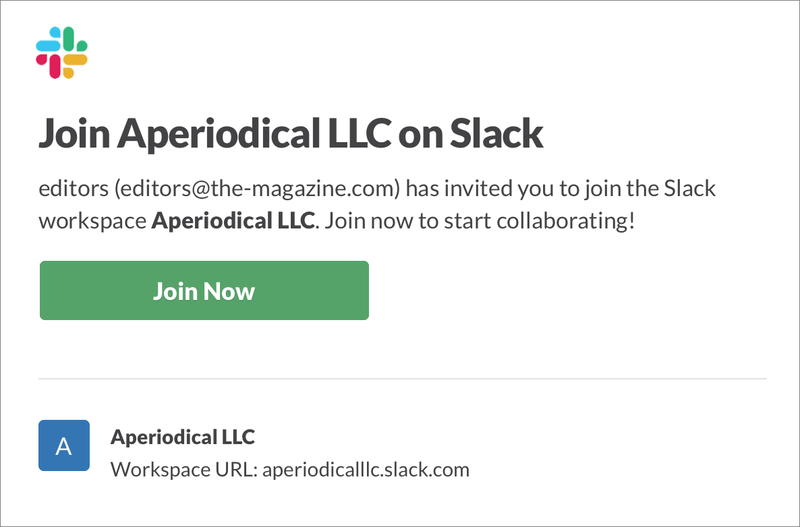 Slack sends an invitation with details about the workspace when you invite members. Advise family members on how to set their Slack names. Slack lets you set a full name and a display name, and it’s useful to figure out how Abigail, Abigail II, and Abigail Jane can be told apart. Names can be changed after they’re initially picked. Help family members install and configure the Slack apps. While Slack sends an invitation email with instructions, the next steps may be confusing for those who have only used built-in smartphone or desktop messaging apps, or has only ever installed WhatsApp, where there’s no central party controlling accounts. 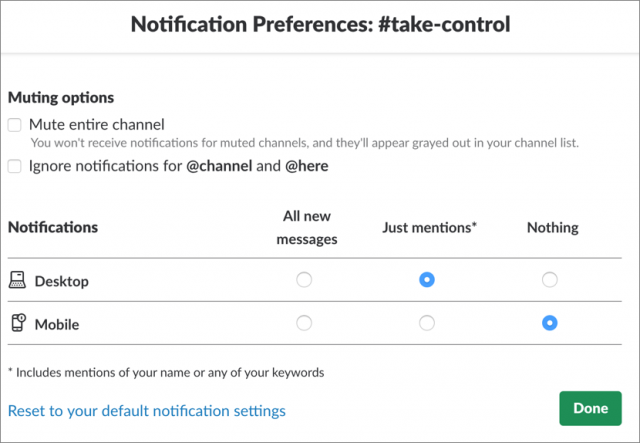 One of Slack’s key advantages and major difficulties has to do with notifications. The system is great about alerting you in a variety of situations that someone has posted in a channel, mentioned you by name, or responded to a direct message. But people may not always want to receive these notifications. Slack has notification preferences you can set for your account in a workspace, as well as for channels and direct message conversations with three or more people. Switching to a Slack workspace won’t solve all the problems with Facebook. But it will help you and your relatives take a step away from the sausage factories of “free” social sites that exist to churn your personal information into cash. Like Apple, Slack treats you like a customer, not a raw material to be monetized.